Chief Minister Shivraj Singh Chouhan announced to increase the honorarium of priests of government-maintained temples by three times. Priests with low income will also get the benefits of the Sambal Yojana. Pujaris of temples owning 10 acres of agricultural land will be able to do farming and can earn their livelihood through the income generated from it. Auction of over 10 acres agricultural land can be done by the priests under the guidance of the collector's representative. 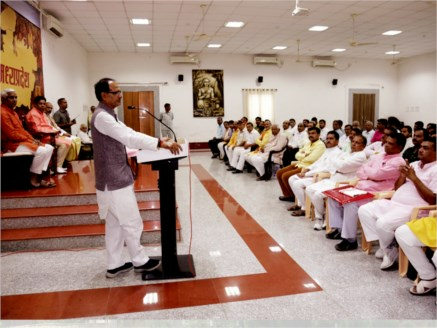 Chief Minister Chouhan made these announcements during the discussions held with a delegation of Brahmin Samaj and Pujari Mahasangh at the CM House on October 4. The delegation apprised the Chief Minister of various issues. The state government has issued orders as per the instructions of the Chief Minister. The priests have welcomed the Chief Minister’s sensitivity and initiative. Instead of the Gram Sabha, now the Sub-Divisional Officer, Revenue will have the right to appoint and remove priests in different government-controlled temples. The priests of these temples will be given the benefit of the Mukhya Mantri Teerth Darshan Yojana. There will be no age bar for them. Loan books will be issued to the priests to make them eligible for agriculture loan for farming in 10 acres of agricultural land. Priests will be eligible for two health check-ups in a year. Homeless priests will be provided houses under Mukhya Mantri Gramin Awas Yojana or Pradhan Mantri Awas Yojana in the village or city.